It’s always been a huge goal of ours to create an event that welcomed everybody. At Yoga Digest we truly believe that every body can do yoga. A dream is becoming a reality as we celebrate the arrival of our very first Yoga Digest FEST, graciously sponsored by the City of Carrollton, Texas. We are so excited to provide a celebration to bring joy to so many. We are also very grateful for the vendors and sponsors who have helped make this so special for our guests! If you are in the area, please join us for the free event that will feature all local and Texas teachers, talent and staff. 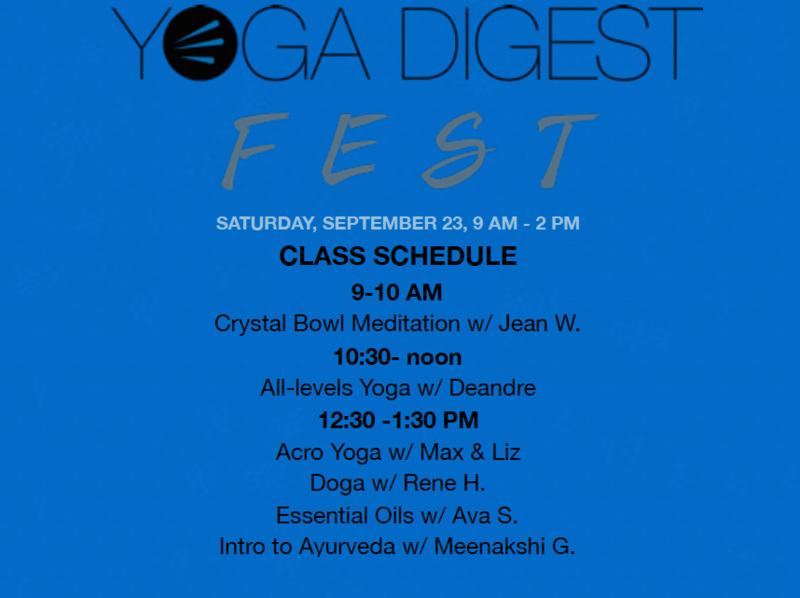 The event will host a crystal bowl meditation, an all-levels yoga class and breakout sessions including Acro Yoga, Ayurveda, Doga (yoga with your dog), Essential Oils classes and plus many vendors and activities throughout the day. There will be goodie bags for the first 200 registers, free aerial yoga demos, lots of giveaways, a raffle for charity and lots of samples. Bailey’s Almande will be hosting a yoga lounge just off the square. Come out and celebrate community, make new friends and share in spreading the mindful and healthy life style with the entire family. We will be taking donations for our local and global beneficiaries: The One Love Movement and Music Is Our Weapon. You do not want to miss! If you can’t make this one, please let us know if you are interested in being a part of an event near you and also be on the lookout as we may already be headed your way!